LA JOLLA, CA—Researchers at the Salk Institute have discovered a startling feature of early brain development that helps to explain how complex neuron wiring patterns are programmed using just a handful of critical genes. The findings, published in Cell, may help scientists develop new therapies for neurological disorders, such as amyotrophic lateral sclerosis (ALS), and provide insight into certain cancers. The Salk researchers discovered that only a few proteins on the leading edge of a motor neuron’s axon – its outgoing electrical “wire” – and within the extracellular soup it travels through guide the nerve as it emerges from the spinal cord. These molecules can attract or repel the axon, depending on the long and winding path it must take to finally connect with its target muscle. “The budding neuron has to detect the local environment it is growing through and decide where it is, and whether to grow straight, move to the left or right, or stop,” says the study’s senior investigator, Sam Pfaff, a professor in Salk’s Gene Expression Laboratory and a Howard Hughes Medical Institute investigator. 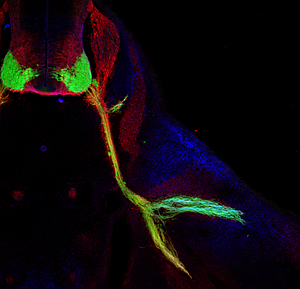 This image shows nerves (labeled in green) that control body movements emerging from the spinal cord of a mouse (upper left, in cross section) and connecting to muscles in the base of the leg. The Salk researchers discovered that a combination of genes direct nerves to split in the leg (lower right) to make the proper connections with their target muscles during early development. “It does this by mixing and matching just a handful of protein products to create complexes that tell a growing neuron which way to go, in the same way that a car uses the GPS signals it receives to guide it through an unfamiliar city,” he says. The brain contains millions of times the number of neuron connections than the number of genes found in the DNA of brain cells. This is one of the first studies to try and understand how a growing neuron integrates many different pieces of information in order to navigate to its eventual target and make a functional connection. 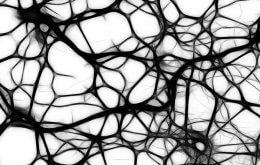 These findings might eventually shed new light on a number of clinical disorders related to faulty nerve cell functioning, such as ALS, which is also known as Lou Gehrig’s disease, says the first author on the paper, Dario Bonanomi, a post-doctoral researcher in Pfaff’s laboratory. “These are the motor neurons that die in diseases like Lou Gehrig’s disease and that are linked to a genetic disorder in children known as spinal muscle atrophy,” Bonanomi says. The researchers say the study also offers insights into cancer development, because a protein the researchers found to be crucial to the “push and pull” signaling system – Ret- is also linked to cancer. Mutations that activate Ret are linked to a number of different kinds of tumors. The other protein receptors described in the study, known as Ephs, have also been implicated in cancer, Pfaff says. The study was funded by the National Institute of Neurological Disorders and Stroke and by the Howard Hughes Medical Institute. Co-authors include, from Salk, Onanong Chivatakar, Ge Bai, and Karen Lettieri; Houari Abdesselem and Brian A. Pierchala, from the University of Michigan School of Dentistry; and Till Marquardt, from the European Neuroscience Institute-Göttingen, in Germany.